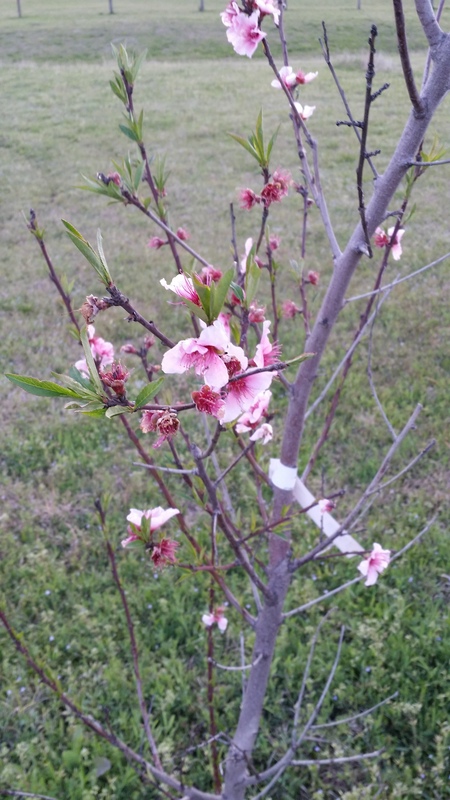 We’ve got quite a few peach blossoms this year–hopefully each one will end up as fruit! This peach variety is “Diamond Princess”. Although purchased at a local garden center, this tree is not well suited for this geographic area. Here are a few lessons I’ve learned–very recently–that will help me select a tree for next year. If you want to successfully grow peaches, you’ll need to do a bit of homework first. Here are a few suggestions. Chill Hours to Set Fruit. Unfortunately, many commercial garden stores stock peach trees that are not suited for a particular area—chill hours too high or two low. Check with your local agricultural extension office to learn more about suitable varieties for your area—and for how to care for peach trees in general). Another factor for the success of peach trees is the root stock onto which the desired peach is grafted. Trees with desired fruit characteristics (large size and numbers of sweet fruit produced) often have weak root systems that are susceptible to nematode infections (results in poor tree health, minimal fruit production–if any). Find a commercial nursery that is able to (1) identify the root stock, and (2) explain why that root stock and peach variety (above ground) is suited for your area. ————- Otherwise, do your own research and learn more about what is best for you (the invested time will save you $$ in the long run!). Peaches require a considerable amount of water to grow, mature, and produce fruit. Are you prepared for the water requirements needed to keep the tree alive and fruiting? In our case, do we want to spend our valuable water resource to keep this tree happy all year without a guarantee that we will be able to receive even a single fruit? If the fruit variety is suitable for your area, consider collecting rain water — you’ll need a lot of water! Growing your own peaches is work-intensive. Be prepared to learn more about what trees are suitable for your area, how to care for them, and ways to collect rain water to keep them happy all year!